Penrith Council General Manager Warwick Winn with Mayor Ross Fowler and staff from LikeMind. 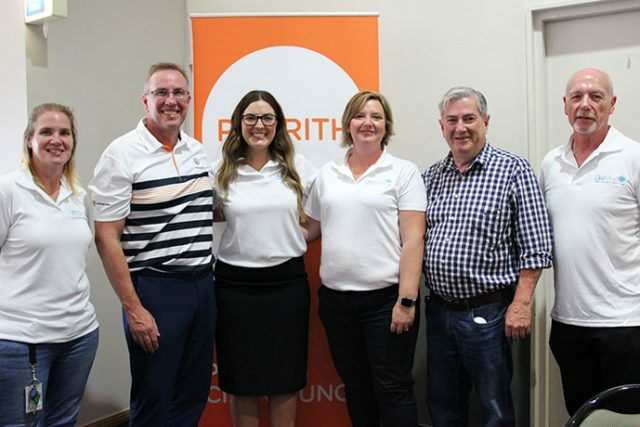 Penrith City Council through its annual Mayoral Challenge Charity Golf Day has raised more than $6,000 for local charity LikeMind Penrith, who provide free and confidential service for adults with mental health concerns, as well as their families and carers. The golf day held in March at Penrith Golf Club brought together local businesses with Council staff to promote team work, local philanthropy and the important role we all play in supporting vulnerable people in our community. Penrith Mayor Ross Fowler thanked Council staff and local businesses for taking part in the annual fundraising event. The Mayoral Charity Golf Day is an annual event which raises funds for a local charity of the Mayor’s choosing. Over the past 20 years, the event has raised valuable funds for local charities including: Platform Youth Services, Rotary House Nepean Hospital, Lifestart, Bravehearts Inc, Nepean/Blue Mountains Prostate Cancer Support Group, Westcare Community Services Penrith; Riding for the Disabled and Nordoff-Robbins Music Therapy and Intellectual Disability Rights Service.